As the 2019 JAMB UTME approaches, it is important for candidates to start preparing and arming themselves with all the necessary information. Perhaps, taking computer-based exams is new to you or you’re not very confident handling a mouse, keyboard and so on. First of all, don’t worry about that, it’s as simple looking at the computer screen and clicking a button. Kudos to you if you’re already a computer guru, that alone will greatly reduce your exam tension. While this article is not really about how to use a computer, you will find it helpful as we will be taking a look at the most important tips for tackling your UTME questions on the exam day. 1. Ensure you fill in the necessary details and check all fields properly. 2. Make sure you read the instructions very carefully. 3. Plan how much time you will spend on each of the subjects. 4. Learn the keyboard shortcuts to answer questions faster. 5. Begin with the Use of English paper and then move to another subject you know best. 6. Don’t spend more than a minute on any question. 7. Select an answer for every question as you meet them. 8. Guess logically by eliminating answers to questions you are not sure of. You may be asked to supply your registration number or some other information which will be used to auto-generate the details which you registered with when you and other candidates are being checked in. This of course means that you must have your registration details especially your registration number at the tip of your fingers. Ensure that you properly cross-check whatever is auto-generated for you at any point. Also make sure it matches your registration details to avoid losing your result to someone else or some other weird problem. As with every examination, you cannot assume you know all the rules. Go through every single instruction that appears on the screen as you proceed to take the examination and ensure you adhere to them. Usually, in this kind of exam, those instructions are usually more like a guide giving you the details as to how you are to proceed with answering your questions. 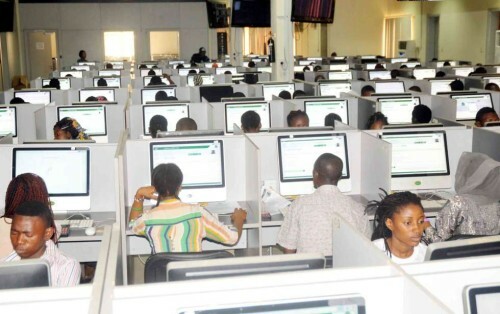 Every instruction given to you by the invigilator of your centre and every instruction you see on your computer screen as you start must be properly and accordingly followed to avoid stories that touch. This will depend on the amount of time that is allowed for the examination. JAMB gives two hours for their exams and this is for 60 English language questions and 40 questions each on the other three subjects. The time they give you should be well shared for the four subjects to avoid wasting much time on a particular subject. If you know what you are doing, the Use of English paper is one paper that you can easily finish in the shortest possible time and have more time for other subjects. So, plan how you will spend time on each subject and be sure to adhere to it even if you have not finished a subject by your allotted time so that you can adequately touch all subjects. Your time will display and count down on the computer screen before you. You can take a practice CBT exam to get a sense for how the exam is. JAMB has confirmed that if there is a power failure, it will not affect your timing. There will be a back-up and alternative source of power supply and your exam will return to the exact place you stopped. All questions are saved upon answering them. Answers to questions may be entered into the computer in either of two ways. You may key in answers by clicking on the option using the mouse you believe to be the answer or typing in the letter of the option using the keyboard. Answers are recorded directly into the computer. The keyboard shortcuts are eight in number and the 8 keys are A, B, C, D, P, N, S and R.
Key A stands for option A. Press the A key on the keyboard to select option A as your answer to a question. Press B if you think the correct option is B. Press C if you feel that the correct answer to your question is C. Press D if you feel the correct answer to the current question is D. Press P or leftwards arrow to go to the previous question. Press N or rightwards arrow to proceed to the next question. The S button can be used to end your exam. Ensure to cross check your work before submitting. Finally, the R key is used to return to the exam. You may be asked to start with Use of English for at least thirty to forty minutes before moving on to other papers but whether you are asked to or not, it is advisable to do that because if you have prepared well, you can finish it fast in about thirty minutes and bag good marks there. Besides, this will give you confidence to take on other quite difficult subjects. When you are done with English, proceed to the next subject that you are strongest in. The reason for this is obvious. You will most likely answer questions more correctly and quickly in subjects you have strength in and this will give you even more confidence to continue. Depending on the types of questions, you may need to spend more time on some than others. Some questions can be easily answered before you even finish reading the question. These kinds of questions should take you not more than thirty seconds to answer. Others require logical reasoning and some calculation (for example, science-related subjects) and will likely take more time. No matter how much time they take, please do not allow the time you spend on them to exceed a minute, if you are going to finish your exam on time. If the question seems to be taking more time than expected, look at the options and check if you have gotten enough information from your calculation and reasoning as the case may be to infer an answer. If you have, please choose the most logical answer and proceed. Speed as much as accuracy is very important in any examination. Had the examination been a pencil and paper type, one would have said to start with the questions you know best and then proceed to the others afterward because from flipping through your exam paper, you will be able to easily identify these easy questions. However, this style cannot be easily achieved in a computer-based exam. in JAMB CBT exam, you will only able to see one question on the screen at a time, even though there will be a provision on the screen to jump to a question number. If you choose to answer the questions chronologically – according to how they are numbered – fine and good. If you choose to pick questions randomly as your instinct guides you and answer – also good. Whichever method you choose, make sure you provide an answer whether you are sure or not for every question before your screen as you meet them. The reason to do this is because you may not have any time left to go back to those questions. If you so choose, you can find a way to note questions you were not sure of should you end up having enough time left to go back. The only questions you may leave and come back to are those ones you are sure you know but that may take too much time to solve. However, when you keep doing this over and over in an attempt to find the simpler questions, you may end up solving little or no questions when the time is up. Remember, once you run out of time, the computer will not hear, “Please sir, just two more minutes”, neither will it go around collecting other people’s scripts while you quickly shade blank spaces on your answer script. Your computer will automatically submit your exam for assessment the very moment your time is up and you will have to stop even if you have not answered a single question. Oftentimes, you will encounter questions for which you have an idea about but are not sure of the correct answer. Some other times, they will be questions you seem to have no idea about. Nevertheless, while many students would usually resort to tum-bum tum-bum – a haphazard pattern of guessing answers to questions with the hope of being lucky – that is not the best resort. The best way to face such questions and provide very reasonable and likely answers is by logically guessing by elimination. This can be likened to the 50:50 lifeline in the “Who wants to be a millionaire” television programme where the computer takes away two incorrect options and leaves two options – one being the correct answer and the other an incorrect option. After reading the questions, if you have prepared properly, when you go over the options, you will discover at least one or two that cannot be the answer. Eliminate them and then work with the remaining options, that way you would have increased your chances or probability of picking the correct answer. Even though, JAMB can sometimes set tricky questions that have very similar options, this method can still prove very helpful. Want to be notified anytime there's a new post? Subscribe here to get the latest updates delivered to your email address by Google Feedburner. Thank u so much for the advice/help,,i have read it like ten times,,but i learn new things here everyday,God bless u.
Amen. Nice to hear that you find it helpful. All the best! You’re welcome. Please see JAMB’s List of Banned Items in Examination Halls. All the best!